When the Babylonians and Medes destroyed Nineveh they heralded the end of the Assyrian Empire. Splitting its provinces between them they inherited a huge swathe of land across the Middle East. The Babylonians were in no doubt as to why the mighty Empire had fallen. The Assyrian King Sennarcherib had destroyed the city of Babylon to remove any doubt as to where the Gods favour lay. Just as the Romans looked back to the Greeks with an admiration for their culture, so too had the Assyrians looked to the Babylonian city states as the source of their religion. This gave the Babylonians too much power in Sennacherib’s eyes, and so he razed the city and enacted the great rituals and festivals in the heartlands of Assyria. His son rebuilt Babylon and restored the Gods to their rightful place, but this was not enough it seemed, and when the Empire collapsed the blame was squarely on the defilers of the Gods, Sennacherib. It’s easy to invoke the Gods when you are on the winning side, but what happens when those same Gods don’t defend you? The Assyrians had already broken the Kingdom of Israel and deported much of the ruling population. When the Babylonians inherited the Empire they continued the practice of moving troublesome populations around. Most famously the Babylonian King Nebuchadnezzar II tore down the Temple in Jerusalem, installed a governor to look after the Kingdom of Judah and brought its leaders, including the young King, to Babylon where they would remain in exile for decades. How did the people of Judah reconcile this catastrophic event with their all powerful god, Yahweh, who was supposed to look after them? Some no doubt turned to other Gods who would be seen as more powerful, others realised that it couldn’t be Yahweh that was at fault, so it must be the people themselves who were to blame. By not being pious enough, by not performing the correct rituals, by not being good enough people, these were the reasons that Yahweh had turned from Judah – more than this, Yahweh himself had caused the Exile to show his anger just as he had hardened the Pharaoh’s heart in order to show his power in the story of Exodus. Great Empires were at the beck and call of Yahweh, but that was no guarantee that the people of Judah would be safe. The prophets of this period (Jeremiah and Ezekiel) were not the first to come up with this sort of explanation. 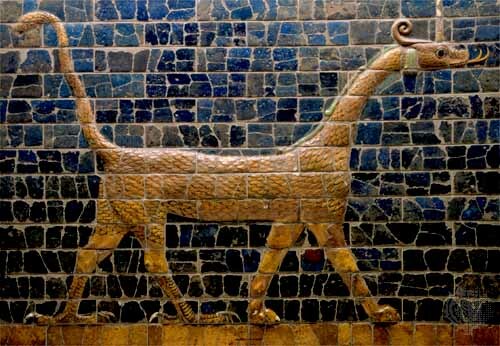 Half a millennium before Nebuchadnezzar II brought destruction to Judah, his namesake, Nebuchadnezzar I ruled in Babylon. One of Nebuchadnezzar’s greatest victories was recovering the cult statue of Marduk from the Elamites who had plundered it decades before. A prophecy was written around the time of Nebuchadnezzar stating that a good king would arise and destroy the cities of Elam, bring back the statue and make the land whole and good. The prophecy talks of the three times that the statue of Marduk had been stolen by invading armies. In each case it does not describe the plundering as something that Marduk didn’t want – after all how could that be since he was the supreme God? When the Hittites captured Marduk around 1600 BCE it was described in the prophecy as a journey to the lands of Hatti in order to establish trade and make the lands known to the Babylonians. After 24 years he returned in the hands of a Babylonian King. When the Assyrians stole the statue around 1200 BCE it is described in the prophecy as Marduk travelling north to bless the people of Assur. His final journey, to Elam (around 1150 BCE), is not described so positively in the prophecy. Marduk declares that he has decided to abandon Babylon, that he has sent the other Gods away and no sacrifices will be enough to lure them back. The land is cursed, and only the rise of the good king will return happiness to Babylon. Unlike the books in the Hebrew Bible which go to great pains to explain why Yahweh abandoned them, there is no such explanation in the prophecy of Marduk. He simply asserts that he will go, and so he does. It is up to Nebuchadnezzar to bring back their God, and as in all good prophecies, he does just that.